Cheesy Buffalo Chicken Spaghetti Squash is a totally crave-worthy lightened up version of the classic! It’s that magical time of year where football rivalry is alive and kicking. Though we’re not all rooting for the same team, one thing we can all agree on is the need for awesome game day eats! After all, you can’t spell football without FOOD! That’s a lie, yes you most certainly can… but wouldn’t FOODball be just as fun!? Whether you’re all about the big game, only in it for the commercials, or not sure which teams are playing… there’s a pretty good chance you’re still ridiculously excited about stuffing your face. It’s no secret, but I’m easily team getting-tissues-ready-for-the-Clydesdale-horses-ad and team hungry-hungry-hippo so naturally, you know where to find me. Serving up something substantial amist the mountains of appetizers? This should be it! We were on our best behavior all month (well, sorta) rocking those New Year’s resolutions like a boss, but now it’s time for FOODball folks! Why should appetizers have all the fun? This Cheesy Buffalo Chicken Spaghetti Squash is loaded with flavor and a totally crave-worthy dinner option. Next grab a lipped baking sheet or a rimmed baking dish and line with foil. To prevent sticking, rub the cut side of the squash with a teeny bit of olive oil and place face down on your baking sheet. Roast for 30-40 minutes, or until tender and easily pierced with a fork. 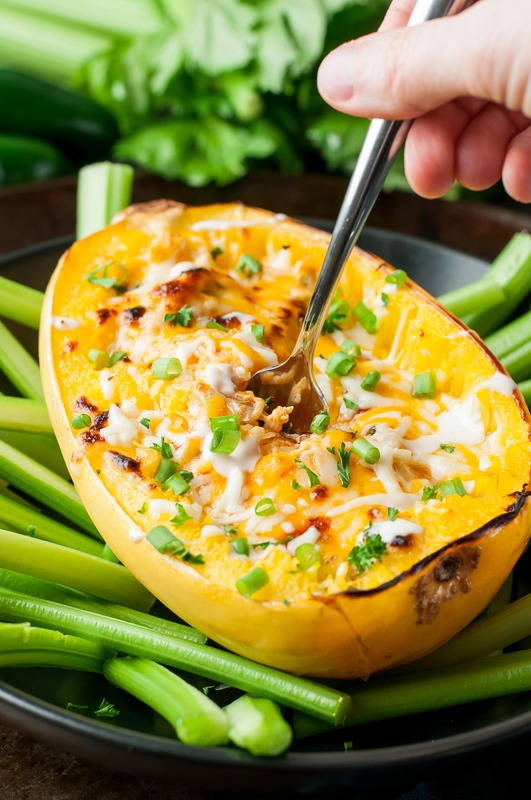 Cooking time will vary a bit depending on the size of your squash, and the exterior of the squash will be visibly softened. The squash can be roasted and stored in the fridge for a few days if you'd like to meal prep and plan ahead for a speedier dinner. You can also make the whole shebang one weekend and pop it in the fridge until about 30 minutes before dinnertime. Wind up with a little bit leftover? It reheats marvelously the following day! Now let's get back to the recipe! While the squash roast, cook chicken via your favorite method or squirrel away leftovers from the previous night's dinner. Shred your chicken and combine in a medium bowl with your cheese (I used cheddar and mozzarella), hot sauce, melted butter, Greek yogurt, jalapeño, green onion, salt, and pepper. 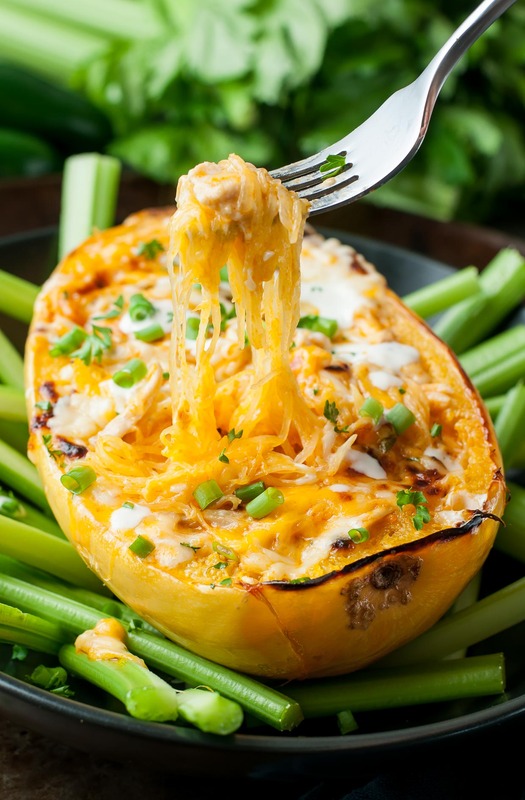 Using a fork, scrape the spaghetti squash bowls to release the delicious strands of squash and mix with your cheesy buffalo chicken mixture. Top each squash with a little extra cheese and place face-up on your baking sheet. Cover the baking dish in foil, leaving a little room at the top (like a tent!) so the cheese doesn't stick. Bake at 350 degrees F for around 20 minutes or until hot and bubbly. For golden bubbly cheese, remove the foil at the end, then change oven setting to broil on high and broil for 2-3 minutes. Garnish with chopped green onion, a drizzle of your favorite dressing, and even extra hot sauce! I roasted 1lb of bone-in skin-on chicken thighs but you can use anything you have on hand and use your favorite method: crockpot, rotissere, baked, poached... this recipe is a great use for leftover chicken too! Serve with celery sticks or a veggie salad for a delicious crunch and extra veggies! Nutrition Facts are an estimate gathered using an online recipe nutrition calculator. Adjust as needed based on swaps and extras. My general rule of thumb for my stuffed spaghetti squash recipes that each spaghetti squash “boat” is it’s own serving. If you’re rounding the meal out with substantial sides, you could easily cut each one in half and serve 8. Need a smaller serving? No problem! Halve the recipe and you’re good to go. This cheesy buffalo chicken spaghetti squash is a fantastic way to revamp leftover chicken from the night before. 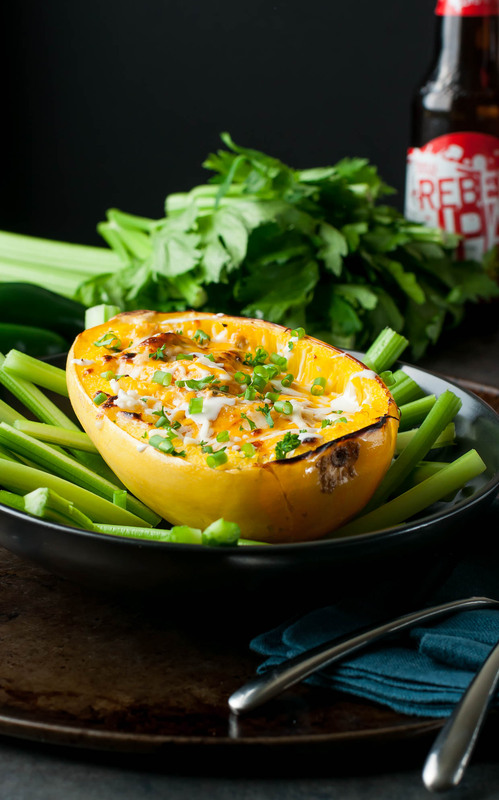 When in doubt – stick it in a squash! Feel free to play around with the cheeses in this one. Cheddar, Gouda, Pepper Jack, Mozzarella, Havarti… choose one or a combination! If you’re feeling extra indulgent you can also swap cream cheese for the Greek yogurt. Is my cheese fandom showing? Ill try to keep it together! I don’t typically have blue cheese handy but it’s a perfect pairing for buffalo chicken dishes like this one. You could also skip the ranch and drizzle a little blue cheese dressing on top if you’re feeling feisty! Feel free to skip the chicken and go pepper + onion crazy in it’s place! You can also try out my vegetarian Garlic Parmesan Spinach Spaghetti Squash recipe which is equally amazing and totally crave-worthy! 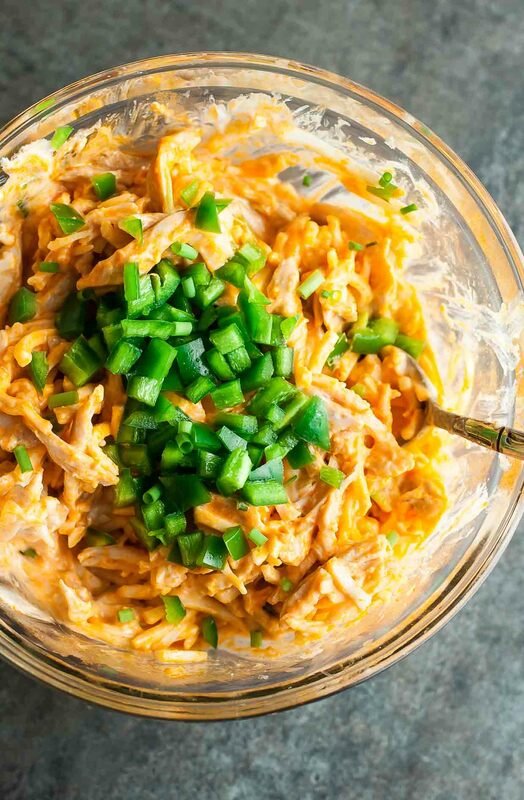 Whatever you do, get this easy cheesy buffalo chicken spaghetti squash in. your. face. STAT! Vegetarian Spaghetti Squash Lasagna — NEW!!! 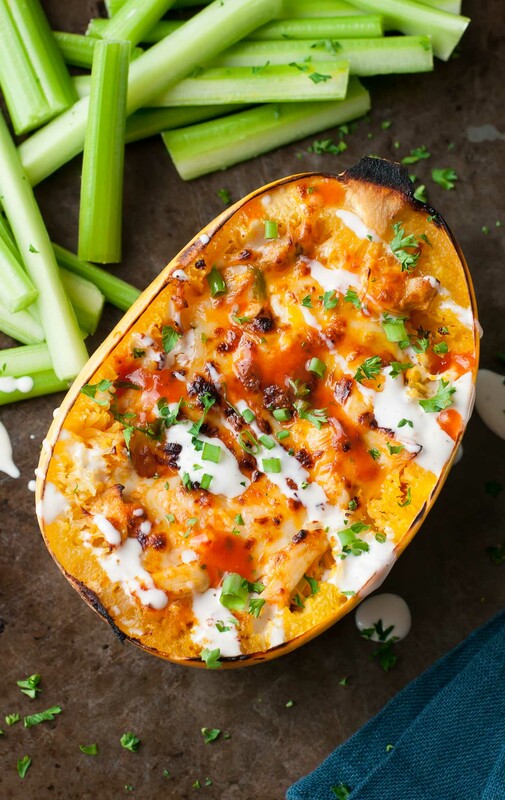 If you get a chance to try these Cheesy Buffalo Chicken Spaghetti Squash Bowls, let me know! You can leave me a comment here (LOVE checking those daily!) or tag @PEASandCRAYONS on Instagram so I can happy dance over your creations. I can’t wait to see what you whip up! I’ve made this a few times now. Never quite the same, but always delicious! Thank you for this idea! I’m a fan of spaghetti squash, but my husband and daughter could live without it. They loved this and so did I! I did substitute the greek yogurt with Sour cream because that is what I had on hand. It was great! Am currently eating right now ????? OMG so good!! Me and my hubs are both loving it!! Totally fulfilling any buffalo wings cravings ?? Thanks for posting!! What would be the calories for have of a serving? Hey Leslie! I don’t currently have the calories for all my recipes calculated yet, but you can enter the recipe into the free nutrition calculator at myfittnesspal.com and get a pretty good read! If you go light on the cheese and use lean chicken breast I would imagine it could be lighter! The glorious thing is that you can customize it to suit your needs. For instance, having half a cheesy serving with a big salad <--- the perfect balance of indulgent yet healthy! This was really good! I subbed roasted cauliflower for the chicken, yummy! Next time I’ll add some red bell pepper as well, and there will be a next time! Made this yesterday with my roommate, SO YUMMY!! Make it, it takes forever but make it. I made this last night for some friends & it was devoured. 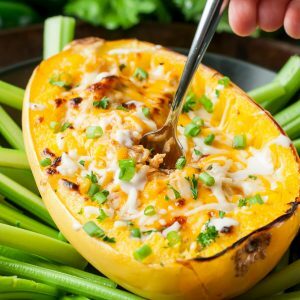 I loved the spaghetti squash because it’s a lighter carb/calorie option & also more filling, so less helpings & more leftovers. It was very simple to come together & your photos & directions made it so. Thank you very much for posting it! WOOT! So stoked y’all enjoyed the buffalo spaghetti squash bowls! Thank you Amy! Made this today. Absolutely delicious! Easy to put together and you can tweek it to your liking. Definitely a keeper! AMAZING!!! My husband doesn’t even like spaghetti squash and he said it was delicious! I added some crumbled blue cheese along with the mozzarella and cheddar. 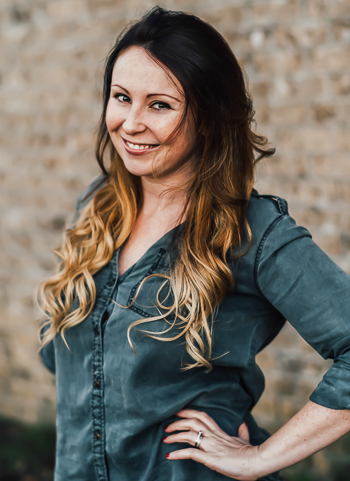 Sounds wonderful Claire – thank you!! I can never get enough spaghetti squash. Love this combination! Jenn, can you please tell me exactly how you roasted the chicken thighs? I’ve never cooked thighs before, but I know they have more flavor than chicken breasts. Thank you! Hey Karen! So super excited for you to try it! The cream cheese option is more for an extra-indulgent dish based on preference. If you were looking for a swap for the yogurt because you didn’t have any handy – sour cream would be a great stand-in here! This is an AMAZING dish!!! We did not include cheddar or mozzarella, but did add some blue cheese with the chicken mixture. We would eat this again and again!!! Yayyyy! So so happy to hear it Sue – thank you! SeconD time making this!! Mmmm so goOD thanks fOr the recipe! Woot Woot! Thanks Niki 🙂 I’m honored to make repeat status in your kitchen! This recipe was ABSOLUTELY amazing. I am a huge fan of buffalo chicken and of spaghetti squash. I was so excited to try this recipe and it did not DISAPPOINt. Every one that i served this to also gave it rave reviews. Thanks! I APPRECIATE your site and the delicious food! I have to say that this cheesy chicken recipe looks amazing. I can wait the weekend to come so I can cook this at home for my girlfriend 🙂 she will be so proud of me when she sees what I have for dinner. Thank you for sharing this recipe with us. This recipe is my absolute favorite spaghetti squash recipe. I make it every couple of weeks because my boyfriend and I both love it. I also love the fact that it is low carb and high in protein. I added more chicken and greek yogurt to the recipe and had enough leftovers for a day or two even after we both ate quite a bit for dinner. I used a rather large squash so it provided a lot of food for us. Doesn’t taste like you are eating on the healthier side at all 😉 10/10 recommend! I also forgot to add that I do not use any butter in this recipe and it still tastes AMAZING! Made this tonight. First I cooked the squash in my crockpot, let it cool down, scraped it out and put it all in a casserole dish and added ingridents except the meat because I was having pork chops and reduced the hot sauce by half and added more Greek yogurt and cheese because I used pepper jack and mozzarella cheese and I only had one small spaghetti squash. Then baked it in oven and also under broiler for extra crisp top. It was delish. My husband loved it. Nutritional information? Fat carbs protein? Hi Doris! I don’t calculate nutrition info for my recipes because many of the services available for recipes are a bit inaccurate and also don’t account for any subs/swaps each individual person makes based on preference and availability. Myfitnesspal.com seems to be one of the better nutrition calculators out there if you’d like to plug in the ingredients you use and the amounts 🙂 The dish is low carb and high protein for sure! It was in the Ingredients….spell check! Really, really good – threw in a little blue cheese as you suggested as well, which really made the dish for me! I’d gotten a little tired of the usual replace-pasta-with-squash recipes and this was a great new idea. Made this tonight and it was delicious!!! I did not have a jalapeño so I left it out.. cooked it earlier in the day and then reheated in a casserole dish. Will be making it many times over…!!!! I can not wait to make this! Any thoughts on a substitute for the Greek Yogart? Any tips for shredding the squash without getting 2nd degree burns on your hands?! Recipe is delicious btw…almost worth the pain ? I made this for dinner last night! My husband and I loved it! So easy to make! This recipe will definitely go in our dinner rotation! I’ve already passed it on to 4 friends who are also on low-carb diets! Use are currently eating it and my child who refused to eat it because he hates squash is gobbling it right up! Thanks for the recipe! Ahhhh yay! You just made my night Stephanie! Glad it was a hit! Do you have any nutrition information? Hey Ashleigh! I don’t currently have the recipes calculated (something I hope to eventually offer once my nugget get’s older and I have more time while she’s in school!) but you can enter the recipe into myfittnesspal.com and get a pretty good read. If you go light on the cheese and use lean chicken breast I would imagine it could clock in around 400 calories per serving? Just a guesstimate. I went a little crazy with my cheese so mine were probably a bit higher in fat and calories, but the glorious thing is that you can customize it to suit your needs. For instance, having half a cheesy serving with a big salad <--- the perfect balance of indulgent yet healthy! Makes sense to me! This will be my first “stuffed” squash; I usually do the plain squash with sauce on top and it gets super watery. Can’t wait to try tonight! Sandy, SUCH a good point and I’m loving the tip especially since I always have a trio of sieves handy! 🙂 Thank you! I was actually just looking at the spaghetti squash today and trying to think of a recipe I could use to make it. This is so perfect!